Apparently this has been on YouTube for a year and has an unusually low number of views; a three-part documentary on creating the debut Cannibal Ox album The Cold Vein. It only runs just over a half-hour but is a wonderful glimpse into not just the singular album but an intimate look into the prime-era of Definitive Jux as a homegrown NYC rap label. 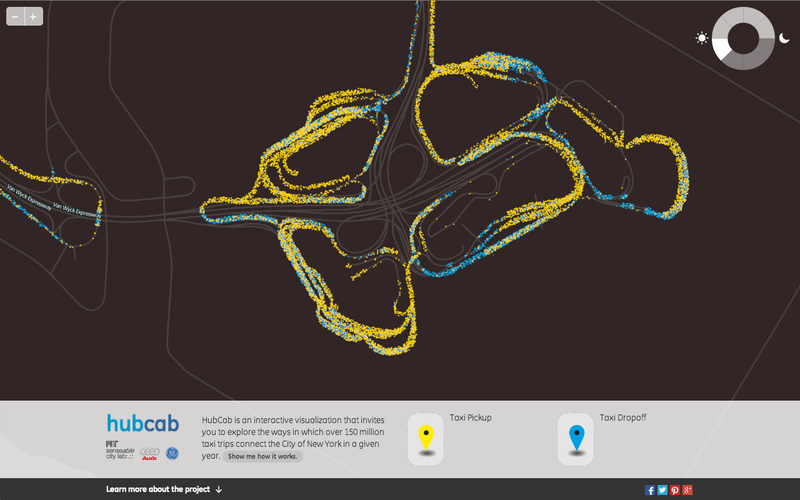 Enter HubCab, a project of MIT Senseable City Lab who captured year’s worth of data from taxi pickups and dropoffs in New York City. The technical development section of HubCab‘s website provides a detailed explanation of the backend required for this level of data processing if you want to nerd out on that, but the interactive map is the clearly the most fun. All taxi pickups and drop offs at JFK airport daily between 3AM and 6AM. Here’s a story, of five friends, living together (not really), but absolutely trying to bring around 100 kilograms of allegedly North Korean methamphetamine into the United States for sale primarily in NYC and Boston. Part Breaking Bad, part season 2 of The Wire – check the indictment below for some interesting reading. An exhibit on display at New York’s Danziger Gallery features the artwork of Parisian Thierry Cohen titled ‘Villes Éteintes’ (Darkened Cities), demonstrating how night skies in various urban metropolises would look without the disadvantages of light pollution. An exhibit on display at New York’s Danziger Gallery features the artwork of Parisian Thierry Cohen titled ‘Villes Éteintes’ (Darkened Cities), showing night skies in various international cities without the disadvantages of light pollution. For those who cannot make it to NYC for the exhibition, be sure to check the online gallery, featuring detailed and accurate depictions of star-filled skies above a blacked-out New York City, Paris, Sao Paolo, Los Angeles, and more. Watch a video of NYC artist Jay Shells, displaying his “Rap Quotes” project, placing road-signs outside of New York City locations popularized by the area’s rap music. Full list of songs referenced in the video beneath the fold. Read more about Rap Quotes on Animal New York. Shells also operates @TheRapQuotes Twitter account, to provide you with online inspiration for those, like myself, who aren’t local. A free download courtesy of Jack Sparrow and Ruckspin (aka Author) as they make their recent performance at Reconstrvct’s Outlook launch party available as a free download. Much respect to Author, and the Reconstrvct crew for putting this together as a part of their Outlook Festival pre-launch party. Keeping in the theme of last week’s Wayback Wednesday we continue with another legendary live release in James Brown‘s famed performance at Harlem’s Apollo Theater released in 1963. The recording, featuring James Brown with The Famous Flames, his vocal backup lead by Bobby Byrd made during the group’s performance October 24, 1962. Clocking in at a mere 31 minutes on the original recording, James Brown delivers a performance that captivates an audience more in a single half-hour than most performers are capable of with 3-4 times that length. For those who missed the debut of this on Monday evening, NYC trio Archie Pelago posted a HD streamable video of their 30 minute mix contributed for Mary Anne Hobbs’ XFM Radio show. The happiest “corner” is actually just inside the western edge of Central Park, where the intersection of 7th and 77th would be (this is just north of the lake and east of the Hayden Planetarium)*. This corner elicits tweets with a relatively high abundance of the positive words “loves” and “sky”, and proportionally less negative words like “not”, “fear” and “no”. Many of the happiest locations actually fall within Central Park! One of the most interesting applications of Twitter is not the social networking aspect, instead, the sheer amount of data the platform generates and the potential to mine the data to identify and solve problems or uncover interesting facts. Another excellent example of data mining and data visualization is in this map that purports to show New York City‘s ‘happiest’ place overlaying geotagged tweets and developing a heat-map using keywords, using labMT scoring, are associated with positive or negative emotions. It has been some time since the last update, here’s something to keep you busy for the moment. Here is the entirety of the 1982 non-verbal documentary ‘Koyaanisqatsi,’ in a mere five minute span. I joined Instagram a little over a year ago, say what you will about the filters but as a platform for sharing photos with friends and quickly posting them to the social network du jour it’s wonderful. The power of the camera in the iPhone 4 family is pretty astounding given it’s size, there was a time I’d at least carry a point-and-shoot everywhere I went just in case but I’m glad that I can get the same quality of photos my Canon SD800 gave me in something I carry in my pocket anyway. With a lot of traveling and stories this year I felt it would be good to take a look at my feed from the past year, and pull out a few favorites and compile a short gallery of photos showing some highlights.